INSITE Lite performs engine diagnostics and displays electronic engine information on the laptop screen. With step-by-step diagnostics, built-in engine drawings and schematic diagrams, working with INSITE is easy. Using this software application will reduce troubleshooting time, errors and incorrect procedures and quickly get your vehicle back on the road again. All software is installed and activated prior to shipment. 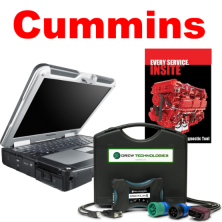 This computer meets Cummins specification requirements.